Part of the magic of Oahu is the dichotomy between the ancient and the modern—the island is home to numerous historical sites, buildings, and areas, but Oahu is also where you’ll find Honolulu, a modern city teeming with skyscrapers and brimming with innovation. Oahu is separated into five main areas: Honolulu, the North Shore, the Windward Coast, Central Oahu, and the Leeward Coast. Note that world-famous Waikiki is actually a neighborhood located in greater Honolulu. Oahu occupies 597 square miles and is the second oldest of the six Islands of Aloha, lying between Kauai and Maui. Oahu is made up of two major mountain ranges that were once shield volcanoes that are now extinct. These two mountain ranges—the Waianae range to the west and Koolau range to the east—run almost parallel to each other. The Waianae range on the west side, separates Central Oahu from the Leeward Coast. For the most part, the leeward (west) side is considerably warmer and drier than the east. The Koolau mountain range spans the length of the island’s eastern coast for about 34 miles from Kahuku in the north to Makapuu in the south. The Koolau range separates the Windward Coast of Oahu from Central Oahu. Today, the Windward Coast tends to be Oahu’s wetter and greener side of the island. Hanauma Bay Nature Reserve: Hanauma Bay is part of the Marine Life Conservation District and a popular snorkeling destination. Located 30 min east of Waikiki, at Oahu’s southeastern tip, the bay is open daily except Tuesdays. $1 per car to park, $7.50 per person to enter. Free for children under 13 or Hawaii residents. Iolani Palace: Iolani Palace was the official residence of the Hawaiian Kingdom’s last two monarchs from 1882 to 1893: King Kalakaua and his sister and successor, Queen Liliuokalani. 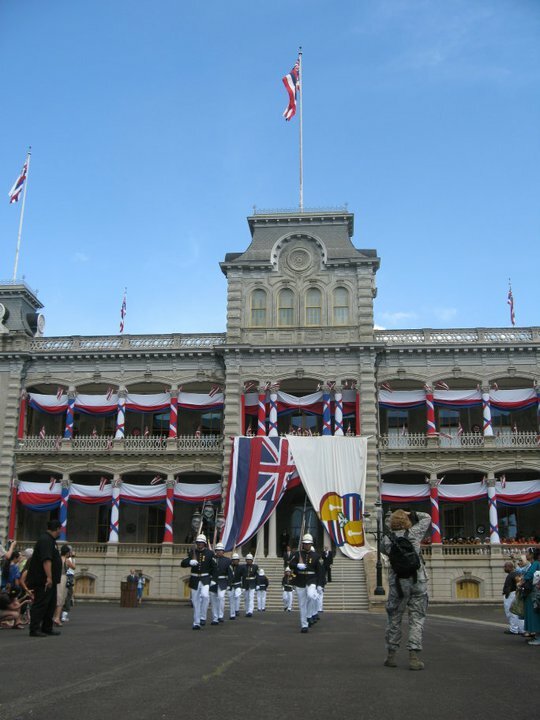 Located in downtown Honolulu, you can take a guided tour or a self-guided audio tour of the Palace Tuesday through Saturday. Iolani Palace is the only Royal Residence in the U.S.
King Kamehameha Statue: The most recognized Kamehameha statue stands in front of Aliiolani Hale (home to the Hawaii State Supreme Court) across from Iolani Palace and a short walk from historic Kawaiahao Church and the State Capitol. Leahi (Diamond Head): This moderately challenging trail includes two sets of stairs, totaling 175 steps, as well as dark, underground tunnels and old military bunkers that require a flashlight. It’s located five minutes east of Waikiki and is open 6am to 6pm, $1 for walk-ins, $5 for cars. Nuuanu Pali Lookout: The Nuuanu Pali Lookout offers panoramic views of the sheer Koolau cliffs and lush Windward coast. You will find it off the Pali Highway between Honolulu and Kailua. There’s no entry fee, but a $3 fee for cars. USS Arizona Memorial: is a place to learn about this historic attack and pay your respects to the brave soldiers that fell that day (you can take a shuttle to the USS Arizona Memorial built over the sunken hull of the Battleship USS Arizona, the final resting place for many of the ship’s crew). Battleship Missouri Memorial: General Macarthur accepted the unconditional Japanese surrender that ended WWII on September 2, 1945 on the Surrender Deck of the Battleship Missouri Memorial. Now located at Pearl Harbor’s historic Battleship Row, the massive “Mighty Mo” is a living museum, with exhibits spanning three wars and five decades of service. USS Bowfin Submarine Museum and Park: The U.S.S. Bowfin (SS-287) is one of the 288 U.S. submarines that carried out the war in the Pacific during World War II. Explore the 10,000 square foot submarine museum to learn about the battle under the seas. Pacific Aviation Museum: The site is an immersive aviation museum complete with interactive simulators and exhibits showcasing the stories behind authentic WWII fighter planes and bombers. Kawela Bay/ Turtle Bay: Protected from large waves and surf, this beach, located on Oahu’s northeastern tip, past Haleiwa and near Kahuku, is one of the island’s best places to snorkel, occasionally offering visitors a chance to see a honu (Hawaiian green sea turtle). Sunset Beach: Spanning in distance from Ehukai Beach (Banzai Pipeline) to Sunset Point and encompassing a dozen different reef breaks, this two-mile length of sand is considered the longest stretch of rideable surf spots in the world. This is also a venue for the Vans Triple Crown of Surfing (November- December). Waimea Bay: This legendary beach is notorious for producing monstrous winter waves and is one of the first places surfers in the 50’s began to ride big waves. Ehukai Beach (Banzai Pipeline): The powerful waves at Banzai Pipeline break over a sharp reef, no more than a few feet from the surface. Makapuu Beach: Located 35 minutes east of Waikiki, Makapuu sits below the Makaupuu Lighthouse on a slope in between the rugged cliffs and jagged lava rocks that contain large tide pools. Waimanalo Beach: This four-mile stretch of sand, fronting calm, clear waters is a great place to learn how to bodyboard and bodysurf. Lanikai Beach: Nestled in a residential neighborhood of Kailua, it features white sparkling sand, calm waters and, for those wanting to be more active, two mini islands called the Mokuluas (Moks) that can be reached via kayak. 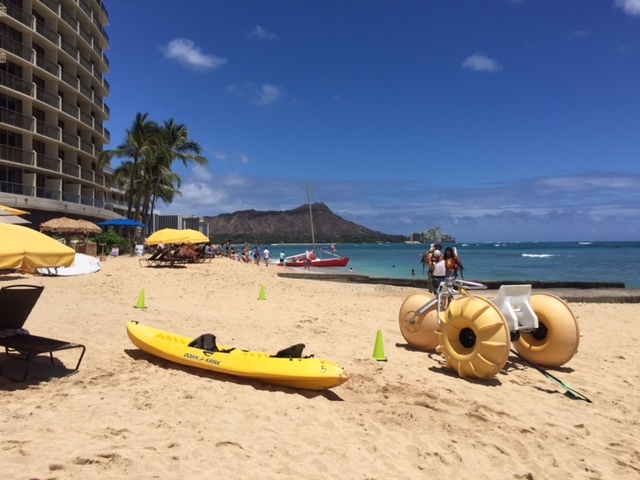 Kailua Beach: This beach is just around the corner from Lanikai and is known for its windsurfing, boat ramp and the opportunity to rent sailboards, kayaks or canoes. Waikiki Beach: Waikiki is actually made of a few beaches including Fort DeRussy Beach to the west, Waikiki Beach (fronting the Royal Hawaiian Hotel and Westin Moana Surfrider), Kuhio Beach (along Kalakaua Avenue) and Queen Surf Beach, home to quieter stretches on the Diamond Head side of Waikiki. Waikiki Beach is the most popular beach for tourists in Hawaii. Ala Moana Beach Park/Magic Island: Extending out from the beach is Magic Island, a man-made peninsula with large seawalls and a shallow lagoon, making it a perfect place for children to swim. Hanauma Bay Nature Reserve: A marine sanctuary, this gorgeous bay lies between two dormant volcanic craters on the southeast tip of Oahu, it’s clear, shallow waters hold a multitude of tropical fish and marine life, making it one of the best places to snorkel on Oahu. Sandy Beach: This stretch of sand is ten minutes past Hanauma Bay near the Halona Blowhole. Surf can be dangerous. Ko Olina Resort and Marina: You’ll find man-made lagoons created for the Ko Olina Resort. This is a perfect spot for families. Makaha Beach: Makaha has the best surfing on Oahu’s west coast, but beware of the sloping sand beachhead that can cause backwash and catch unsuspecting visitors off guard. Yokohama Bay: This is the last sandy stretch on the Leeward Coast, and its curvy beach and turquoise waters are great spots to sunbathe as well as watch surfers and dolphins. Whether you want the country or the city, adventure or relaxation, mountains or valleys, you can find it all on Oahu. So, give yourself time to explore all the island has to offer and make it a vacation to remember!